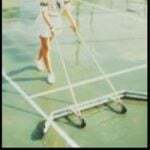 This European design allows full width tennis net, which is uncommon in this region for budget systems, and are the only budget posts available with across top tennis net cable path as required in the rules. Ideal for multi-purpose courts as it is fast and easy to attach the net. This system is ITF compliant and used at Perth Arena for the Hoffman cup. It takes a post to post net and the net cable is on top of the post. For more information click here or watch our video. 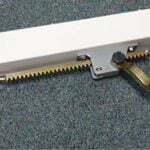 The winder in this post is a linear system and is hidden completely inside the upright so when you have tensioned the post, you can take the winder away and have elegant, smooth posts that will never rust like steel models. These posts take a full post to post net and can be tied off against the post to maximise aesthetics. Traditional heavy duty steel posts for top level competition. 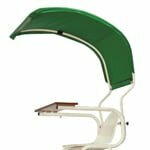 This model also includes a special thermal coated finish, more durable than powdercoating designed to last longer and retain it’s luster in the harsh Australasian conditions. Mobile tennis net post system for multi purpose fields. Supplied complete with net, these systems have been designed with a height stamp to lift the wheels off the surface to immobilise while in play, and better distribute the weight of the system on sensitive surfaces. Our TEN 1 (full drop) and TEN2 (760mm drop) net fits all our posts perfectly. The TEN 1 has a tapered bottom so when held down with a centre strap, the bottom of the net is parallel to the court. 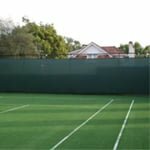 We supply and install Powergame Sports Surface for the best all weather proof, player friendly outdoor tennis sports surface with no maintenance ever required and backed by a 15 year manufacturers warranty. Approved by International Tennis Federation and rated as “Fast”. 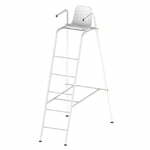 TNUC Tennis umpire chair with sun roof protection.